Members of chambers attended a series of events during Hong Kong’s Maritime Week at the tail end of 2018 to celebrate Hong Kong’s renowned role in the maritime industry. 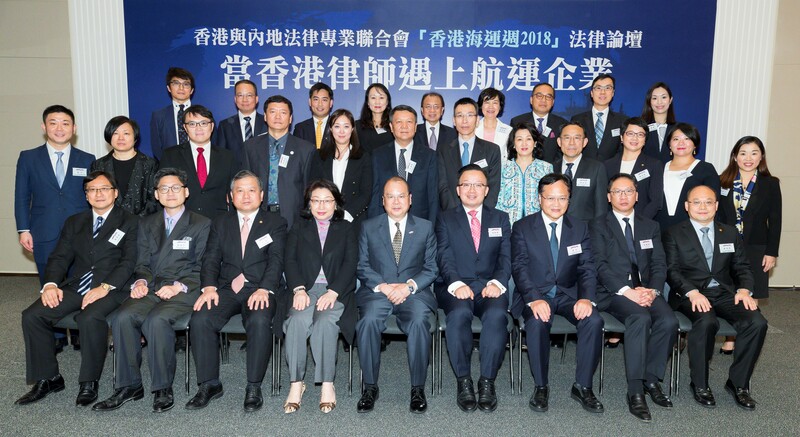 In particular, Patrick Fung SC, Sabrina Ho and Tiffany Chan attended a forum entitled “When Hong Kong Lawyers Meet Shipping Enterprises,” which addressed key issues in the way forward for Hong Kong’s thriving maritime industry. The forum, organised by the Hong Kong and Mainland Legal Profession Association, attracted Hong Kong qualified solicitors and barristers, Mainland lawyers from Hong Kong, as well as a myriad of legal practitioners and executives from Chinese enterprises. Mr. Mathew Cheung, Chief Secretary for Administration, Ms. Teresa Cheng SC, Secretary for Justice and Mr. Rimsky Yuen SC, former Secretary for Justice delivered keynote speeches to the attendees. The forum covered the opportunities and challenges facing Hong Kong under the “Belt and Road Initiative” and “Guangdong Hong Kong Macau Greater Bay Area” Initiatives, the respective pros and cons in choosing litigation or arbitration in dispute resolution for shipping enterprises, and the risks and prevention of legal noncompliance in the industry. Patrick Fung SC shared his past experiences in litigation and arbitration and offered his views on how to safeguard Hong Kong’s position as the heart of arbitration in Asia and and deliberated on how Hong Kong could continue fostering confidence from shipping enterprises by tailoring the trinity of litigation, arbitration, and mediation to different enterprises. Sabrina Ho targeted issues central to Chinese shipping enterprises that are involved in multinational deals: covering questions on how to minimise the risk of cross-country disputes, and how to manage them once instigated. Together, participants shared their views on how to preserve and strengthen the value of Hong Kong’s common law system, its prime location, international standing and the steady development of its arbitration scene to international shipping enterprises. Who was recently appointed to join the ICC’s Young Arbitrators Forum? Testing the waters: Are Team-Based Commissions and Bonuses Deductible from Employees’ Statutory Entitlements? Aparna is a HK qualified solicitor with over 15 years’ cumulative experience in law, marketing and business development.She has boosted rankings, engagement and client growth and translates business initiatives and marketing strategies into tangible results. She is well equipped to help with your practice development needs. © Des Voeux Chambers 2017 All rights reserved.